Today I am going to write about something completely different. Let me introduce you to this amazing girl. This is the reason why I started blogging again. I don’t even quite remember how I came to this website but I think the main reason was instagram. I started following friends and other people and they used the hashtag #fmsphotoaday quite a lot. So I done some research on it to see where this is coming from and what it means. That’s how I found fatmumslim aka. Chantelle. If you are into photography and social networking I highly recommend her blog and projects. 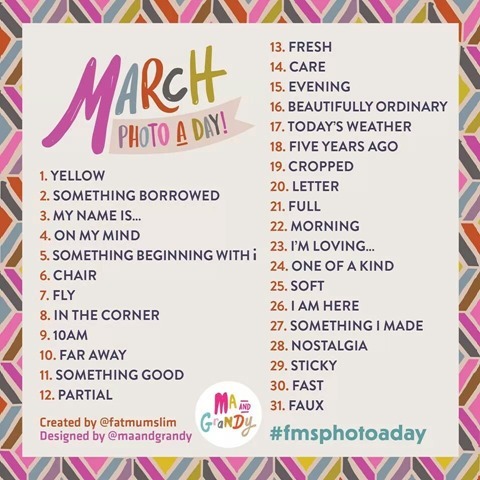 Definition #fmsphotoaday: This is a fun game really that involves taking photos everyday all around you and instagram or Facebook. Chantelle is posting a photo every month end. So for example below this is for March. So take out your phone or camera and start snapping away. It’s great fun. You have to use #fmsphotoaday as if you are lucky she will be pick you as one of the lucky 4 the next day that caught her or the admins eye. This is not the only thing she does. Have a read through her blog. She started a new project called “Scattered Love” for example. or lovely Juice and Food recipes.